For your average computer user, the idea of using a foot pedal as an input device might seem superfluous. After all, most of us already have a keyboard, mouse, trackpad, and maybe even a webcam. Is another input device necessary? 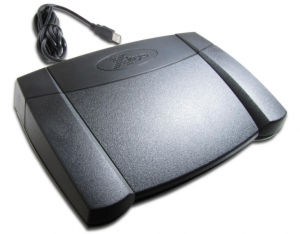 For transcriptionists, a foot pedal is an essential tool. Using one means keeping your hands focused on fewer tasks and maintaining greater productivity. In your transcribing job, transcription foot pedals are necessary to pause, rewind, and fast forward audio recordings. This means you can use keystrokes for standard typing and not have to worry about additional “hotkey” commands to control audio functions. Using fewer keystrokes also improves your turnaround time. Many transcription firms (including Allegis) require their transcriptionists to transcribe using specific software programs, so considering bundled software is unnecessary. Note: Always check to make sure any foot pedal you’re considering purchasing is compatible with your specific transcription software. A complete and helpful review of software is an entirely different topic that would require a separate blog post—which we may tackle at some point in the future. Transcriptionists who don’t need to buy software will save money (and probably some confusion) by leaving software out of the equation, if possible. Pro tip from Michael Yolen, our QA Manager: Be sure to plug your foot pedal in prior to opening your transcription software and beginning a transcribing job. For example, Audioworxs (used at Allegis) will sync most foot pedals if they are already plugged in. If that’s not the case, you must log out, plug in your foot pedal, then log back in. It’s a general issue many transcriptionists run into with many other transcription software packages as well. Here we begin our review of stand-alone foot pedals. These are our picks for the best stand-alone hardware. 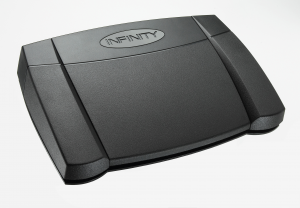 The Infinity USB pedal is a very popular option for transcriptionists and receives great reviews—it also happens to be a foot pedal we often recommend to our own transcriptionists here at Allegis. The Infinity pedal is compatible with many types of software, which is certainly nice should you need to transcribe using a different software program in the future. It offers a combination of value and sturdy construction for long-term use. A good alternative as a “workhorse” pick, the Phillips is a bit pricier than the Infinity pedal but has a four-pedal design for additional functionality. 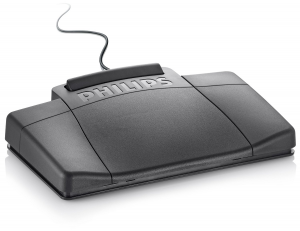 This transcription foot pedal boasts sturdy construction for durability and an anti-slip pad to keep the device in place. Need more flexibility? A rear-hinged pedal is ideal for continuous activation (like playback), but the X-keys model also comes in a front-hinged version that is ideal for momentary activation (almost like a mouse click). All three pedals are programmable for maximum flexibility and functionality, making it a great choice for almost any transcribing job. X-keys also provides downloadable functions on its website for additional functionality options. If you already have too many wires under your desk or are tired of USB connections coming loose, this may be a good option for you. Wireless is more expensive, but many transcriptionists appreciate the convenience. This pedal uses magnets instead of the typical mechanical switches, so there’s no noise when the buttons are pressed. A supplied USB dongle plugs into your computer and communicates with the pedal, which is powered by three AA batteries. The Bluetooth wireless transmitter has a range of up to three meters. What Transcription Foot Pedal Do You Use? For most transcriptionists, foot pedals are an essential part of their transcribing job. As with any tool you’re using for long hours, finding a comfortable and quality fit is key to performing well. 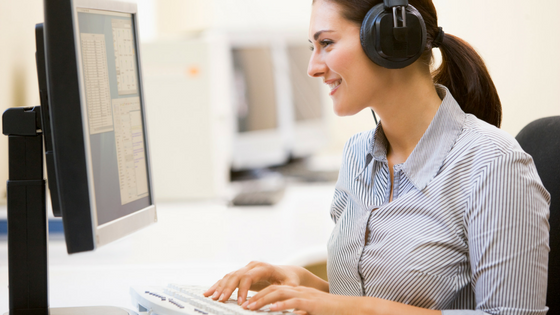 Greater comfort and ease of use means improving your transcription output—and that usually translates to a bump in your paycheck. As always, we hope that this information has been valuable to you. Please leave us a comment to let us know if you currently use or have tried any of these recommendations. If we’ve overlooked any great options, please let us know in the comments. We’d love to hear from you! My Infinity has got to be at least 7 years old. I am on that thing full time, and it can take a beating. But I would love to hear from anyone who has used a wireless foot pedal. I’m curious if there’s any lag time to playback. I just bought wireless earbuds and love having one less wire to untangle. Another option I’m interested in is a foot pedal that can time code. Michael what transcription company do you work for? I’d love to hear durability feedback on the wireless model. My first Infinity lasted nine months. My current Infinity is about a year old so I’m pretty sure a new one is in my near future. Idon’t understand how Infinity got the best rating. I’ve had horrible experience with them for years. Haven’t tried another brand yet, tho. 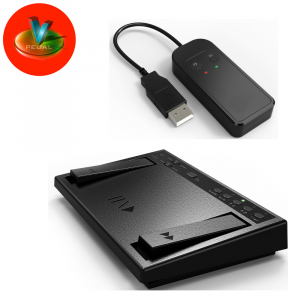 I would like to know if the V pedal wireless is compatible with the MModal platform. I work for Command Health, so the MTApp is used. I just don’t want to purchase and then have it be not compatible. Are there any other wireless pedals available?